Art teams are popping up all over the place nowadays. Not only are they a fantastic way for a brand to demonstrate its product power, but they also act as a platform for hairdressing’s finest young talent to show us what they’re made of. 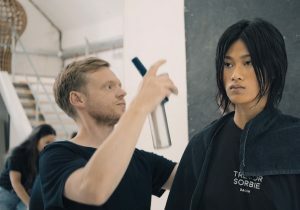 Partnering with the creative powerhouse at Trevor Sorbie, KeraStraight is offering hairdressers nationwide the chance to become part of a hair revolution. Members of the Collective will be able to tap into the creative genius of the Trevor Sorbie Artistic Team, led by Tom Connell and Ryan Forsythe. This dynamic duo will share their unique knowledge and experience on everything from demonstrations to shows and seminars. There’s already a creative shoot and stage work lined up so it’s going to be a busy first year. Members will also become social media champions under the watchful eye of Katie Braden, the PR genius behindKeraStraight, INNOluxe, Sophia Hilton and Not Another Salon. Hairdressers will develop their influencer skills and learn how to stand out from the social media noise. For more information and how to enter click HERE.